Easy and comfortable hiking is all that Millet Davai Pointures UK Homme provides. It is made to cover most of your leg, to ensure that you are comfortable and safe when hiking. The men’s boot has a sturdy but a flexible construction. What more, its design is attractive and the red color amazing. Millet combines style and functionality in the most intelligent way. For those who want a great hiking boot, for varied terrains but remain fashionable, they will certainly fall in love with this boot. 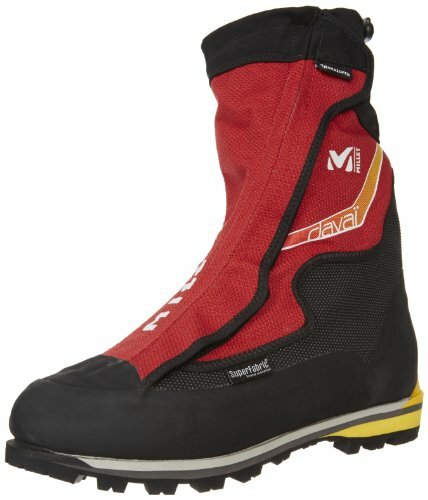 What makes the Millet Davai Mountaineering Boot tick? Hiking comes with its fair share of challenges. The Millet Davai hiking and mountaineering boot covers most of your feet and rises up beyond the ankle. That is ample protection, especially if you are hiking in bushy areas, where the unexpected can happen. Besides, the upper part of the boot helps to keep the feet warm. Furthermore, since the boot slims as it goes up the ankle, it keeps debris from getting inside. The upper part of the boot is made from a waterproof material. The covering ensures that no water comes into the boots, either from rainfall or from dew. It also prevents the feet from getting cold from the water or the humidity outside. The waterproof material is also very durable, to stand the extreme weather conditions, which is subjected to. The outsole of the Millet Davai has a sturdy construction. The rubber sole, restricts thorns or any other sharp objects from finding their way into the boots. It is also the main foundation of the hiking boots; it stabilizes the shoe as you hike, to prevent you from toppling. The sole has been made to provide maximum traction, to maintain your feet on the ground. The mid-sole is located right in the middle of the front and the rear sole of the hiking boot. It is molded to maintain the boots in balance. It takes up the shock that arises from the rough hiking ground. The midsole is highly optimized to ensure that it is ergonomic, for the optimal maintenance of your physical health. Right on, the footbed of the boots lies a removable inner sole. This looks similar to your feet but padded to offer comfort. It can be removed at will, especially when you want to clean the boots. The Millet Davai is not an ordinary hiking boot. It is has been designed with the latest technology, to provide waterproof properties but remain breathable. It is made of high-quality materials, which confer the durability, which is needed in a hiking shoe. The outsole and the ankle length boot provides you with maximum protection. It keeps your feet from the wrath of the wilderness. It allows you to trek the most challenging hiking trails without incurring injuries. Get your pair of boots and transform your hiking experience.